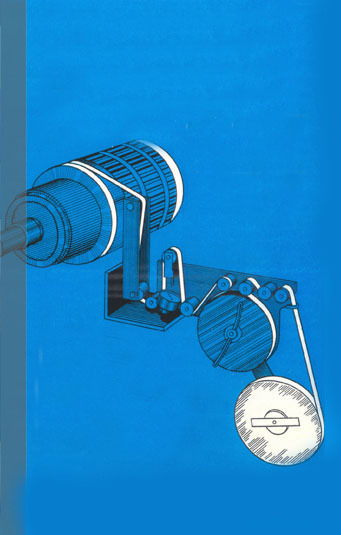 Insulating band for electric motor armatures – Imavolt S.A. The main purpose of this band is to prevent the movement of coils under centrifugal and electromechanical forces. The system usually bands both heads of the coil with several strands of tight steel wire with high breaking resistance (> 70 Kgs/mm2) and under deformation coefficient. Each group of spirals, which are binding, are fixed by welding at several points on the periphery, after finishing this operation, carry out balancing static and dynamic of rotor, as well as impregnation with an insulating varnish. A) Over time, the work-rest cycle can lead permanent deformations in bindings and more easily, in welding which tin material is not elastic, but rigid. Once slight is release of the band, vibrations and displacement of conductors are produced, causing wear and deterioration of insulating materials. B) In the case of direct-current machines, the steel of each binding, which is a closed circuit, becomes induce currents due to variations of magnetic field caused by switching. 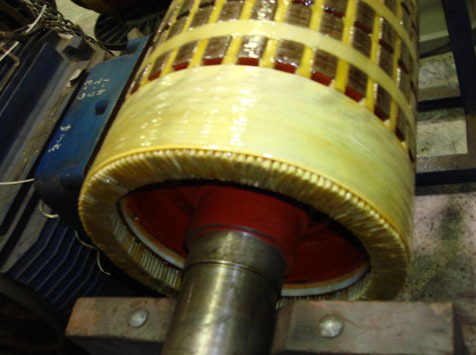 Such currents result in losses due to the JOULE effect, which can make welds and insulating materials reach dangerous temperatures. C) High mechanical stress to be given to steel spirals and the small contact surface of the wire, determined the cutting of the insulating material necessary to place between the binding and the coil, with the possibility of damage during welding. D) Danger of discharge between conductors and the binding, higher when machine tension increase. 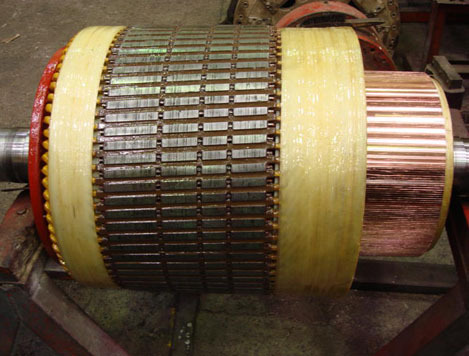 E) The need to place good insulation between steel wires and winding, specially in high voltage machines, makes the banding difficult. For proper application, required excessive specialized labor costs, considering the level of difficulties, which are produced by this type of banding and the increasing capacity of smaller electric machines with better performance, this encouraged search and development of other products. Among those who have done this, we can mention the Italian Railway Administration who entrusted the possibility of conveniently solving these problems to a group of technicians specialized in reinforced plastics. After a short period of tests, glass-resin binding shown to be completely suitable for this application in the technical field as well as in the economic one, due to the lower number of non-specialized staff required to do the job. In order to compare one system with the other, it would be better to define that the calculation of the thickness of these bindings should refer to a breaking resistance value due to traction of the glass-resin mix of 60/70 kgs/mm2. To sum up, it is advisable to use sections from the quadruple metallic banding, if it is intended to use 240/280 kg/mm2 wire. It is a tape made up of several parallel roving cords, impregnated with an thermosetting resin (polyester, epoxy) in stage B, with different resin contents, resulting in a tape highly resistant to traction, with low elongation, high module and excellent resistance to impact.